Arash Sigarchi, former editor of Gilan-e Emrooz, was the subject of the Middle East Quarterly's Dissident Watch in the fall 2005 issue. He recently received asylum in the United States. This article is adapted from a speech he gave at the American Enterprise Institute in Washington, D.C., on February 4, 2008. — The Editors. I was a newspaper journalist in the Islamic Republic, but censorship forced me to blog. My blogging led to my arrest and eventual departure from my homeland. To comprehend how pervasive censorship is in Iran today and how difficult it is for Iranians to access a wide range of accurate information about everyday news, it is essential to understand how the Iranian government censors journalists. Iranian censorship is enforced by six major entities. First, the Supreme National Security Council, charged with defending the country from external enemies, has become omnipresent not only in domestic matters but also in journalism. On a weekly basis, upon direct orders from Supreme Leader Ayatollah Ali Khamenei, the Supreme National Security Council informs journalists and newspaper editors of new themes of censorship. Ahead of the March 3, 2008 U.N. Security Council decision to sanction the Islamic Republic for its uranium enrichment program, the Supreme National Security Council sent a letter to newspaper editors and instructed them to respond with articles describing nuclear energy as an Iranian right. The second group, the Iranian judiciary, acts upon the direct orders of the supreme leader. If the supreme leader questions one item, this might lead to the closure of twenty to thirty newspapers. The judiciary might order only temporary closures but, in practice, their long duration makes the shutdowns permanent. In addition, security forces have killed two journalists and imprisoned another seventy. The Intelligence Ministry has imprisoned several hundred people for interrogations. 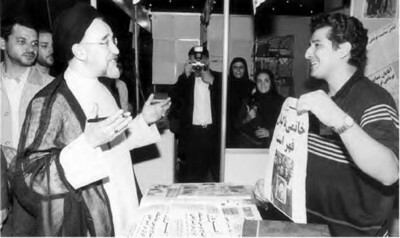 Arash Sigarchi (R) greets Iranian president Mohammad Khatami at the Iranian Press Festival, 2001. Security agencies are a third group that exerts pressure on journalists and newspapers. As a journalist in the Islamic Republic for twelve years, I was never able to criticize the Revolutionary Guards (IRGC). To do so is simply forbidden. Toward the end of Mohammad Khatami's term (1997-2005) and the beginning of President Mahmoud Ahmadinejad's administration (2005-present), the Ministry of Information and Security—Iran's intelligence ministry—began to summon all newspaper journalists to ask them to cooperate with the system. Their message was clear: Those who cooperate can work; those who do not will go to prison. Those who cooperated with the regime received economic privileges. Some of my former colleagues chose to accept the regime offers and today hold positions of power. The Office of the Friday Prayer Leaders is a fourth mechanism of censorship. The Friday prayer leaders exist to provide the supreme leader a representative in every major town and city. They are, in effect, mini-Khameneis. As Khamenei censors at the national level, so do the various Friday prayer leaders enforce censorship in the provinces. For example, in November 2003, Ayatollah Zeinolabedin Ghorbani, the Friday prayer leader of my hometown of Rasht, spoke about a house that cost $200,000. During the following Friday prayer session, he criticized the system in which workers cannot afford decent housing. I published a response suggesting that it would be more productive if the system actually helped workers get decent housing rather than simply talking about the situation. The same day the article appeared, seven people attacked and beat me, and the judiciary fined me $1,000, a significant amount in Iran, for insulting the sacred matters of Islam. The fifth group consists of the so-called "pressure groups," which many Iranians refer to as Hezbollahi groups. They are similar to Germany's pre-World War II Brown Shirts, who roughed up anyone deemed an enemy or insufficiently loyal to the regime. These groups, who attack journalists because of political opinions and writings, are attached to the Basij resistance force, to the Iranian Revolutionary Guard Corps, and to the various security agencies. After I criticized Ghorbani, I also experienced this firsthand. Vigilantes attacked me and my staff in our newspaper office. Sixth, beyond external censorship, there are internal pressures that also constrain Iranian journalism. Economic actors constrain journalism. The Islamic Revolutionary Guards Corps has extensive economic interests. Their companies maintain advertising relationships with newspapers. For example, if an IRGC-owned factory wishes to hire workers, they will place a notice with the local newspaper. When a newspaper is critical of the regime, however, the IRGC will ban any company in which it has an interest from advertising in that newspaper, severely curtailing the revenue that paper can expect. For this reason, most newspapers practice self-censorship. In the Islamic Republic, newspaper editors do not have the freedom or independence to determine their own publications' content. The regime approves the newspaper executives who oversee the editors and enforce censorship. In addition, self-censorship is rife. Many of my colleagues resisted becoming mercenary pens in the hands of others, but they censor themselves to avoid arrest. Often, the sentences for journalists are severe. But, if they show contrition in prison, they win early release. If they return to reporting the truth, the state quickly returns them to prison. Many journalists, after receiving a taste of incarceration, are far more mindful of what and how they write. The lack of real journalism hurts the Iranian public by promoting a false sense of international diplomacy. Ahmadinejad, for example, has said that Iranian discussions with the entire world with regard to Iran's nuclear issues are over, but he still negotiates with Westerners. The entire world has sanctioned us economically, but few Iranians inside the Islamic Republic understand the full nuance or effect. Another example: In 2007, Ahmadinejad visited Gilan to inaugurate a sports stadium. This year, it was announced that the stadium had opened. What the newspapers could not report, however, was that the stadium had been slated to open fifteen years ago. Nor could the Iranian papers ever report that a day after Ahmadinejad inaugurated the stadium, it shut because it had not yet been completed. The press also misleads with regard to the economy. After the supreme leader said that the Islamic Republic needed to be self-sufficient with regard to cereals, for example, Ahmadinejad reported that under his government, Iran had, indeed, become self-sufficient. Soon after, my wife and I traveled from province to province. In southern Iran—provinces such as Hormozgan, Bushehr, and Khuzestan—I took pictures of foreign ships importing cereals into Iran. Clearly, neither the politicians nor the newspapers reported the true situation. As a result, politicians could not implement the proper policies to enable the agricultural sector to meet real rather than fictional goals. You might ask if Iranian journalists are asleep. No, we are awake, but in prison. So how can Iranian reporters pursue the who's, what's, where's, and why's that underpin basic journalism? Many—myself included—started blogging. Everything that I could not publish in my newspaper, I wrote on my blog. When I started in 2001, the Iranian government was not too aware of the Internet, and so I got away with straight reporting. But they soon caught on. I was arrested briefly on August 29, 2004, and, again, the next day. On January 17, 2005, the Revolutionary Court sentenced me to ten years imprisonment for cooperating with the U.S. government, two years for insulting the Iranian leadership, and two years for conducting propaganda against the Islamic Republic. Despite the crackdown of which I was one victim and Ahmadinejad's efforts to shut down blogging, the phenomenon has taken off. When I was arrested, Persian was already the fourth most popular language for blogging. Today, two million people write blogs in Iran. I firmly believe that the only group that can counter the demagoguery of the Ahmadinejad government are the bloggers. With the help of their efforts, censorship in Iran will be crushed. Arash Sigarchi is an Iranian journalist, living in Washington, D.C. He is the recipient of the 2007 Hellman/Hammett award for writers who have suffered political persecution. He blogs at www.asigarchi.blogspot.com. Agahsazi (Tehran), Mar. 3, 2008. The Guardian (London), Dec. 20, 2004.